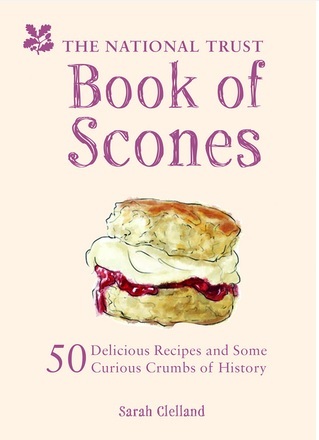 These are worrying times for the Scone Blogger. 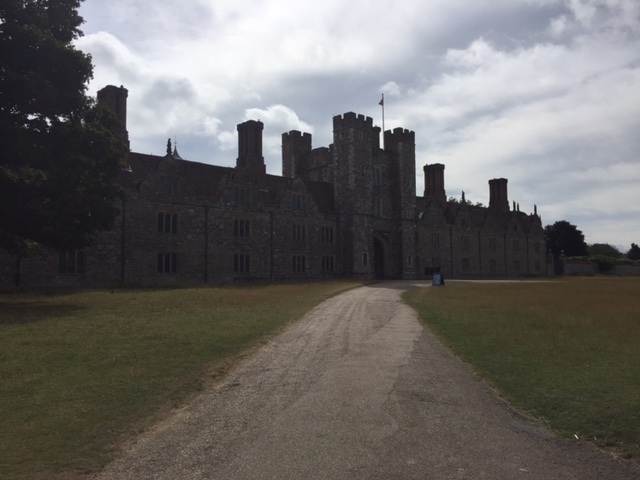 This week the Scone Sidekick asked if we could go back to Knole - this is the SECOND time in THREE years that he has asked for a say in where we go. I could be on the verge of a coup. 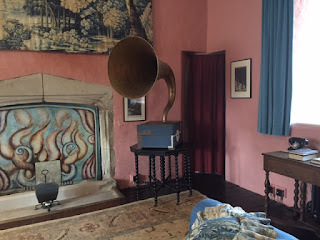 But his reasons were actually very valid; last time we went to Knole it absolutely TIPPED it down with rain and there were NO SCONES - in fact, there was NO TEA ROOM, never mind any scones - and we were both very dejected. 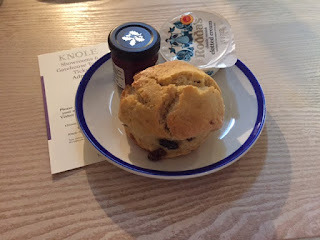 In fact, I laid into Knole at the time for the lack of tea room. 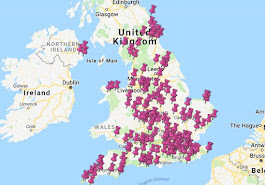 I just couldn't it work out; in 2014 they decided to close the cafe and replace it with a Portakabin and an outdoor seating area FOR TWO YEARS. TWO YEARS! But I'd like to say sorry to Knole for my critical words back then, because today I realised the enormous scope of the renovation work that's going on; they're spending around 18 MILLION POUNDS on stopping Knole from turning into a festering pile of damp (my words) and that can't be easy. Anyway. I'm not going to tell the story of Knole again - you can see it on my original moany post. But I will highlight a few things we saw today that we didn't see last time. My favourite factoid about Knole is that Thomas Sackville, who built the place, was known as 'Fillsack' because he was always on the take. But it paid off! A later Sackville with the same attitude managed to relieve Whitehall of a load of furniture that the royals didn't want anymore. Whitehall later burnt down and everything in it was destroyed, which means that Knole has chairs belonging to James I and the other Stuarts that are completely unique. I wasn't allowed to take a picture of this, which is a real shame, but one of the guides pointed to a faded old chair with arms that looked brand new. AMAZINGLY, when the conservation team looked inside the seat of the chair to see what it was stuffed with, they discovered that it was full of remnants of the original fabric! Imagine that! So they took those pieces and put them on the arms to show how the chair would have looked new. 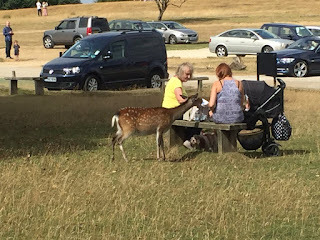 It's worth going to Knole for that alone. 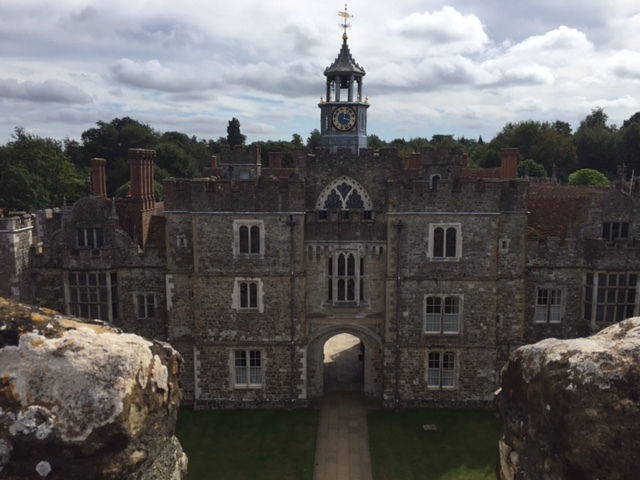 We also got to go up to the top of the Tower and look out over Kent and down into the courtyard. It's a massive place. The new cafe is very nice, although I did have a moment of panic when I couldn't see any scones. I then had another moment of panic when mine looked dry and hard when I cut into it. But it actually turned out to be really tasty - worth going back for. I would suggest that you head to Knole soon though, if it's scones you're after. They have deer in the grounds and they are ruthless in their hunt for food, as the photo below clearly shows. They might not eat your children, but they'll certainly eat your picnic. They'll have the scones away in no time, mark my words. Anyway. We then decided to drive the extra 10 miles and check out Hever Castle, or Heaving Castle as I am going to call it. 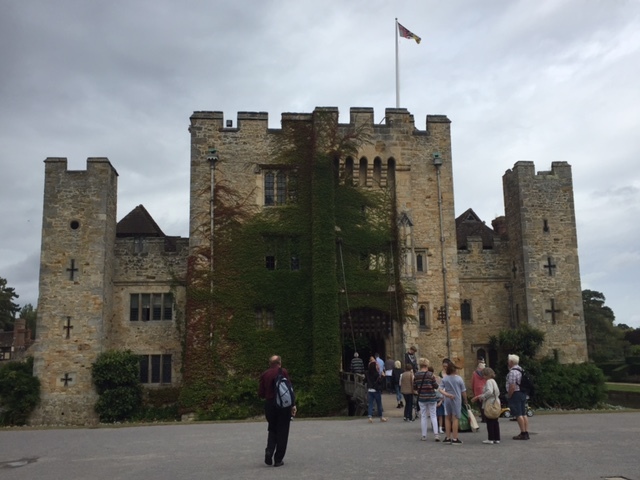 Hever is privately owned and not part of the NT or English Heritage. The reason for its popularity is very simple: it's the former home of Anne Boleyn. I seem to be following her around at the moment - I went to Blickling a couple of weeks back, which is supposedly her birthplace. Anyway, her story is nicely told at Hever and there's plenty to look at, including some beheading swords. It was great to see so many kids asking questions about Henry VIII and Anne B - it really is a very compelling part of our history. I was particularly moved by Anne's final letter to Henry before she met her grisly end (it basically says 'I am completely innocent and you are going to burn in hell for this' but in a slightly more polite way). We didn't stop for a scone, as that would be very disloyal.